Waltzing Matilda is pretty much considered to be Australia's unofficial national anthem. We all learn the words as kids and we know it was written by Andrew Barton 'Banjo' Paterson but how many of us know how the song came to be written? In January 1895, Banjo Paterson was travelling in Queensland with his fiance, Sarah Riley, when they stayed for a few weeks at Dagworth Station, a 100,000 hectare property near Winton in north-western Queensland. The station was managed by Bob Macpherson, the brother of one of Sarah's old school friends, Christina Macpherson. During the couple's stay, Christina played for the group a traditional Celtic folk tune called 'The Craigeelee' which captured Paterson's interest. Christina had played the song from memory and didn't remember any words to it or even if there were any words to it. But Banjo Paterson decided that it would be a good piece to set lyrics to and wrote the words during his stay at Dagworth. Christina was not a musician but she ended up writing the score for the song. While he was at Dagworth Station, Banjo heard the story of a shearers' strike which took place on the station in September 1894. In those days, shearers worked long hours in stiflingly hot tin sheds and were often treated unfairly by the station owners. On this occasion the strikers were protesting against their treatment and things became violent. The strikers fired their rifles and pistols in the air and set fire to the woolshed, killing dozens of sheep. The man thought to have been one of the ringleaders was Samuel Hoffmeister. He was pursued by the owner of Dagworth, accompanied by three policemen and, rather than be captured, shot and killed himself at the Combo Waterhole. 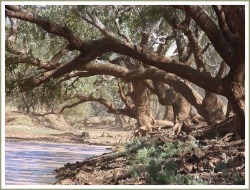 Bob Macpherson and Banjo Paterson rode together during Paterson's stay and, on one ride, came across a newly-killed sheep at the Combo Waterhole (pictured on the left). The sheep looked to have been killed by a swagman. The story of the shearers' strike, the discovery of the dead sheep and the setting of the waterhole combined to inspire the words to Waltzing Matilda. 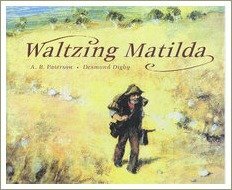 Waltzing Matilda was written by hand and Paterson revised it several times so the original copy has notes scribbled in the margins and quite a bit of crossing out. This makes it hard to decipher accurately so we're not completely sure what some of the original words were. To complicate things further, changes have been made to the song over the years, most famously by the Billy Tea company who used the words in an ad in 1903. 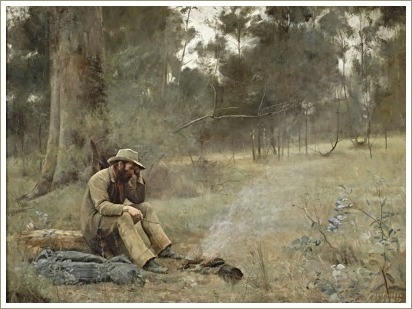 The company felt that the line 'drowning himself by the coolibah tree' was too dark so they removed it, creating the version that's most widely-known today. Waltzing Matilda was first recited in public by Sir Herbert Ramsay at the North Gregory Hotel in Winton on 6 April 1895 at a banquet for the Premier of Queensland. The first version on this page is the original words, using the words Banjo Paterson scribbled at Dagworth Station in 1895. Below that you'll see a second version, using the words as they are usually sung today. You can hear The Seekers sing this version here on YouTube. Up rode the troopers, one, two, three. 'Where's that jolly jumbuck you've got in your tucker-bag? 'You'll never catch me alive! ', said he. The last two lines of the final verse are sung in a hushed, ghostly tone, after which the song goes back to its cheerful, up-beat tempo. You can hear Slim Dusty sing this version here on YouTube.